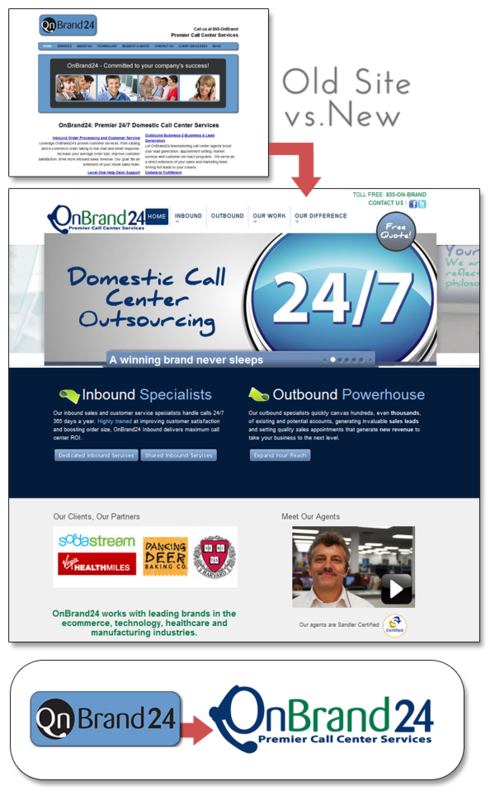 Company: OnBrand24 is a Massachusetts call center that delivers maximum ROI with a full range of telemarketing and telesales services designed to cost-effectively kick-start the sales revenues of their clients. The Opportunity: OnBrand24 has been delivering superior call center services for over 30 years. Through highly educated and trained agents, OnBrand24 is able to become an extension of the brands they represent. However, OnBrand24 wasn’t effectively presenting their difference in a clear, engaging and tangible format using the Internet. OnBrand24 was also not effectively capturing the enormous potential to drive new business via Internet marketing. Results: It is still very early, but here are some exciting results so far! Visitors are spending over 10 minutes on the new site compared to just over one minute on the old site. Visitors are now looking at over 7 pages compared to 2.5 on the old site. Need to step up your Internet presence? We would love to learn more about your brand. Drop us a line or give us a call at any time to see how we can help you drive results.